Too long since my last post but I’m back! The venue was Studio 96, situated between Little Italy and China Town. When I checked the address, and before arriving, I really wasn’t sure what to expect of the venue as this area of the city can be a little “colourful” (I actually grew up in this area when we first moved to Edmonton). The venue was beautiful! It was a 100 year old abandoned church that was slated for demolition when it was rescued from impending doom and repaired and converted into an event space. It was large enough to comfortably hold the crowd (I’m guessing about 80?) seated in a large U, but still held an intimacy that made the dinner feel like we were dining with close friends and family. Once all the guests arrived (and I truly felt like we were guests at chef Daniel’s personal table) we were greeted by Chef Daniel Huber who explained how the evening would unfold. 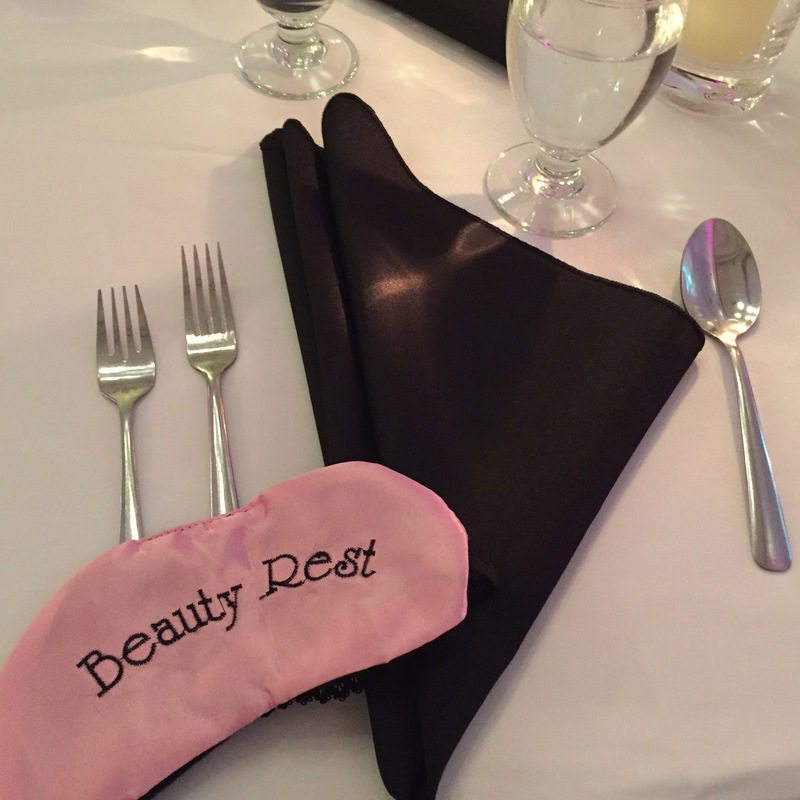 We were instructed that we would wear the provided blindfolds for each course and then when the plates were cleared we could remove the blindfolds and make notes of what we thought each dish consisted of. Between each course we would also be served a beverage that paired with the meal. Once we were all blindfold the first course came out. Putting our hand cautiously to the table in front of us we could feel a paper bag. Reaching in it was a familiar item, light, crisp, buttery, salty… It was popcorn! Probably the best popcorn I’ve ever had! Was that because one of my senses was removed so I was tasting it differently that I ever had before? It had more too it than just some cinema snack though and without site somehow hard to put your finger on what that flavor was that you couldn’t quite place. A fun first course to be sure. There was a buzzing energy throughout the room. Laughter from many, and conversations with our fellow patrons that wouldn’t be common at a typical restaurant dining room. The second course was served and was not quite as easy to dig into as the first. With a little panic in her voice I heard the lady sitting next to me exclaim “it’s soup!” Now eating soup with a blindfold, that’s an adventure. It was velvety in texture, had a smoky note to it, and seemed creamy. It was delicious. Again I couldn’t quite figure out what the ingredients were that kept us all dipping our spoons until our bowls were clean. Course #3 arrived and I gingerly put my fingers to the plate. Sticking my finger in something cool and creamy I licked it off. By this time I had abandoned my cutlery to be able to “see” my food with my fingers. It was a creamy, cheesy salmon atop a crisp cracker. A hint of dill was there too. Quite tasty and we all devoured the creation. The next course arrived and had a few puzzled. I heard a few quesses from the people around me. Someone thought maybe it was tofu, some thought cornbread. I knew after the first bite that it was polenta. Topped with beef and a well rounded spicy sauce. This one we were told had more the 27 ingredients in the sauce alone. How on earth were we supposed to guess each one? Tricky chefs haha. I half used my fork and half used my fingers, after all who was judging, no one could see! I thought I could detect a hint of cilantro but when talking with my friend Dave he said no way as he doesn’t like cilantro and he liked this. His guess for the sauce was some sort of curry. (As it turns out there was cilantro in the polenta). The final course arrive and my friend Meghan squeeled with delight. Chocolate! Our desert course was here! It seemed obvious what it was, a brownie with a berry purée sauce. Something crispy on top too, maybe toffee? What ever it was, it was a delight! Once the final course was cleared we were served our final cocktail pairing which was a cider that Chef Levi had brewed the day before. It had spicy notes of cinnamon and clove. A great end to an amazing meal. We toasted to a great evening then the chefs let us in on what all the courses were. What a unique and fun experience. 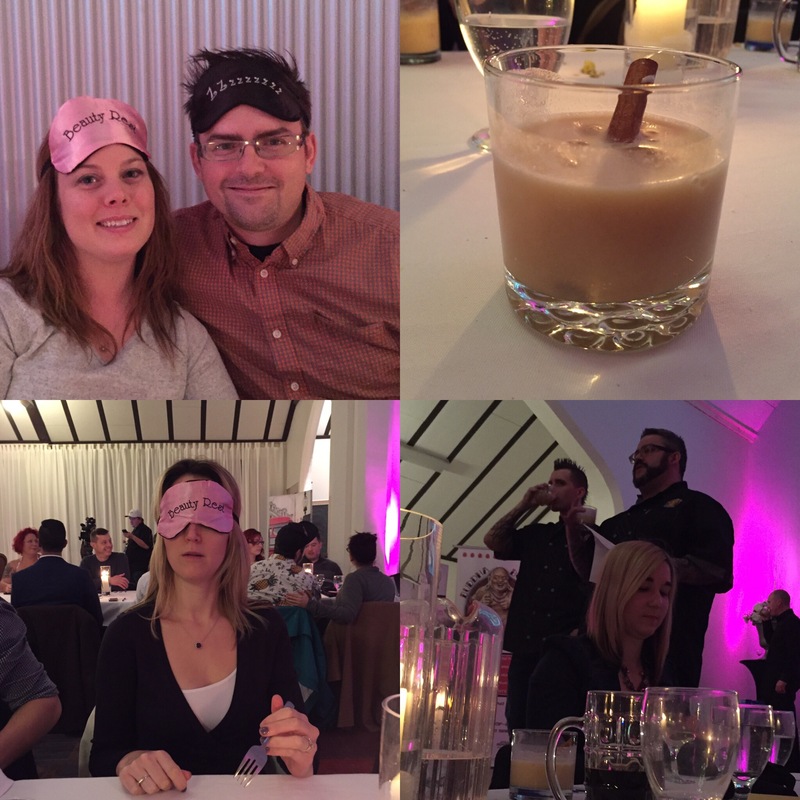 If you ever get a chance to have a blindfolded dinner do it! And keep your eyes on The Buhhda Boys to see what they are up to next. Ps: The Bhudda Boys is the coming together of two great chefs to form a partnership of a diversified food services business. According to their website, Facebook page and Twitter account they are offering catering, consulting and event planning.